About 2 years ago a small company innovated with something as simple as a camera storage card by sticking wireless connectivity in it and giving the ability to wirelessly transmit photos from a basic digital camera to a computer and online photo site wirelessly. 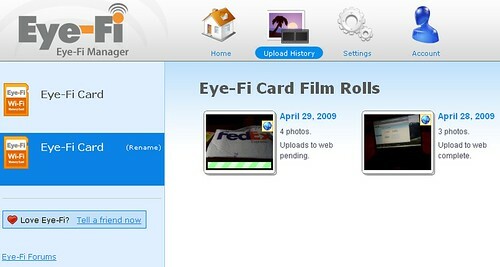 Eye-Fi over time, also added the ability to wirelessly upload video, geotag the photos with the location taken and added many new online sharing sites. I've just received their latest version of the Eye-Fi with many additional features I thought were missing from their earlier product. The basic premise behind the Eye-Fi is a solid one. Take most digital cameras, plug in the Eye-Fi SD or SDHC memory card and you can wirelessly transmit photos to your computer and to your favorite online photo/video sharing site and even automatically geotag that photo with the location the photo was taken. Yes you can do all of this manually with many additional steps, but not this easily. The original Eye-Fi was a simple, but smart creation. This new video-aware version along with Eye-Fi's other improvements make the card even better for those that need the process to be crazy-easy or even those that are just don't want to mess with the additional steps required to do all of the above. Better yet, if you want it to, it tags where you took the photo as well. Note: Shared WEP and Apple’s version of WEP TSN are not supported. 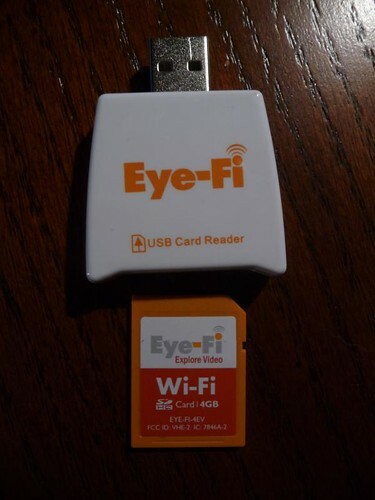 I received this latest version of the Eye-Fi card thanks to Dave Zatz of ZatzNotFunny! 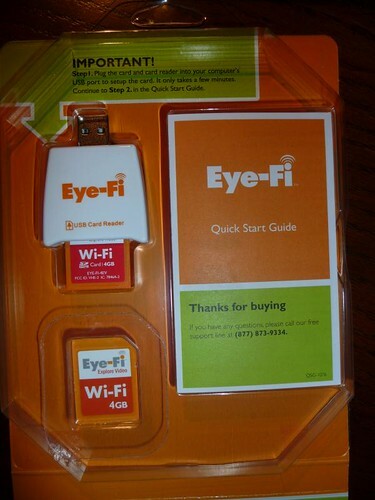 who had reviewed the earlier version of the Eye-Fi card last year. 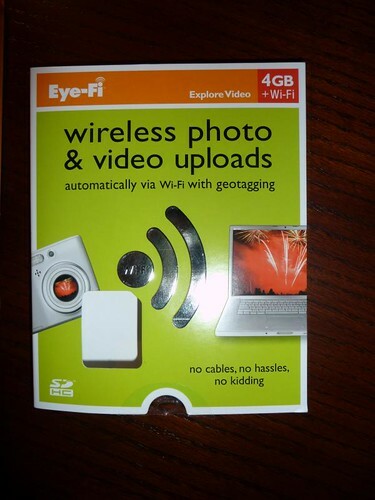 This review card is the highest-end version called the "Eye-Fi Explore Video" that runs $99.99 retail. The card has one year of public wi-fi hotspots (formerly WayPort, but now owned by AT&T) access, geotagging, 4GB SDHC storage and video upload capability. The review was done using my Panasonic DMC-TZ5 camera that has SDHC and video capability. Setup was as easy as it could be. I plugged the card into the provided reader (actually you can use the reader or your own SD card reader) and the card was detected immediately on Windows or Mac computers. Installing the software and proceeding through the registration process (this "attaches" that card with your account) is done via web page to set up your Eye-Fi account. Once you've registered the card automatically searches for available wireless access points. Select your WiFi access point and enter your "network password" (WEP 64/128, WPA-PSK, WPA2-PSK key). The setup then runs through a few tests and then your card is connected to the wireless network - you can set up multiple Wireless networks if needed. You then can optionally enable hotspot and geotagging. You can configure to optionally upload photos to your computer along with options to add the date, use photo creation date or upload date etc. Once you've set the Eye-Fi card up on your computer, using it is easy. Take your photos and videos anywhere and as soon as you're in range of your home Wi-Fi network or one of the public WayPort hotspots (only the ones that don't require signons) it will upload the photos automatically to the places you designated during setup. I set mine to upload to my personal HTPC computer (so I can instantly view the photos on my HTPC and laptop digital photo frame) and to upload to my flickr and YouTube account. Depending on the file size (high quality photos and all videos can take a bit of time), the photos upload automatically - in my case less then one or two minutes for a bunch of photos or a even one or two short video clips. If you turn off your camera or go out of the WiFi range before it has uploaded all of the photos, it will continue where you left off next time your camera is on and in range. On your computer, you'll see the following pop-up notification show up on your taskbar with a preview of the media being uploaded. TRANSFER TIME:The longest it took to upload the highest quality JPEG photo my camera could handle was 15 seconds. Videos took longer, but no longer then one minute per short video clip. 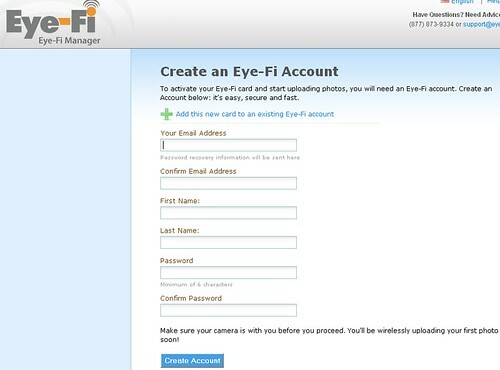 You also can see your upload history and adjust settings using the Eye-Fi manager (website based) on the computer where you installed the software on. On the version I tested (Eye-Fi Explore Video) there is one free year of public, wireless hotspots access which gives you the ability to upload photos and videos. I tried this out on four different wireless hotspots (WayPort now owned by AT&T) and of the four, one of them actually allowed me to upload photos. 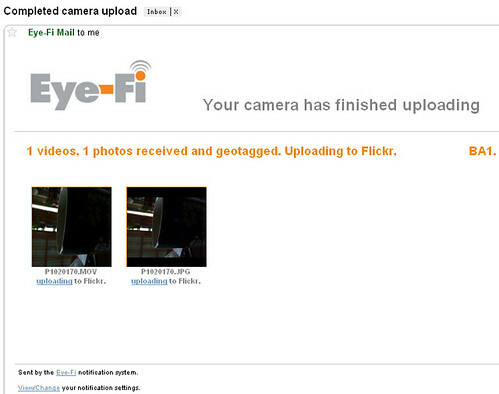 This is because many of those hotspots require some sort of login - which your camera can't do. So not quite as useful as it first seems. When it works though it's quite useful - I had some photos I took at the Kansas City airport that uploaded to my computer at home and to flickr as soon as I snapped the photos. And best yet, I could see previews of those photos on my phone moments later. Geotagging is another really nice feature. If you enable the feature in the setup, any photos you take on the Eye-Fi card are tagged with the location they were taken at. This is not an exact science as the location is determined based on the local Wi-Fi it can attach to. I found that this worked throughout Kansas City where I took my pictures even when I couldn't upload a photo on one of those many public hotspots, the Eye-Fi was still able to grab the location to geotag the photos. Obviously some will be slightly mis-tagged if there is no nearby Wi-Fi, but it will typically capture the city your in as soon as it can grab a nearby Wi-Fi location. Other than the initial bad card I received, everything worked nearly perfectly with the Eye-Fi. I say nearly because there was about 10 minutes where I couldn't upload photos. Why? Because their website (probably server) was "under maintenance" in the middle of a Wednesday. This exposes an issue with a service that requires a central server the way Eye-Fi does although you could always hack your Eye-Fi if you really needed to. I don't see this being a big deal, but it definitely is a possible weakness in the service if something ever happened to the company. 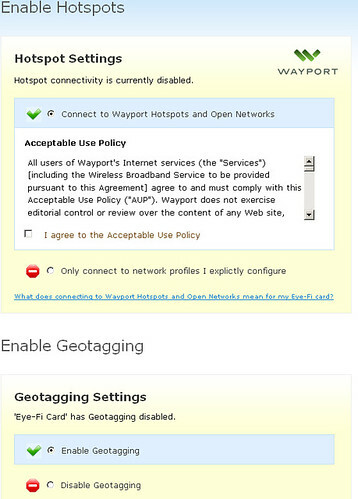 will geotag all photos and adds Wayport hotspot uploads (free the first year, $19/yr thereafter). While the geotagging feature is pretty cool, until/unless Starbucks hotposts (AT&T or T-Mobile) are added, I’d purchase the Share card… which I’m surprised they’re not offering (yet?) in 4GB capacities. It's going to upload every single photo you take - even the bad ones. 4GB capacity has arrived finally. And is definitely required if you plan to record video with this card. Eye-Fi Home $49.99 - Basically the original 2GB version that allows you the capability to upload Jpeg photos to your computer wirelessly. While there are certainly cheaper (and faster) SD and SDHC memory cards available, the convenience and ease the Eye-Fi provides is something you should consider. I think wireless is a technology we'll begin to see integrated into more and more photo and video cameras going forward, but for now, Eye-Fi is a great way to get the additional features at a low cost and easy-to-setup process. I recommend this to most casual photographers and probably the average blogger as well. I convinced my parents to buy one of the older versions of Eye-Fi and still consider this new one a great option. With my Panasonic TZ5 camera I was able to snap photos and videoclips and have them arrive on my computer, laptop digital photo frame, flickr and YouTube without even thinking about it. The slightly higher cost for the Eye-Fi card is definitely worth it for me and I think worth it for a good number of casual photographers as well. Read more about Eye-Fi and purchase at the Eye-Fi website. 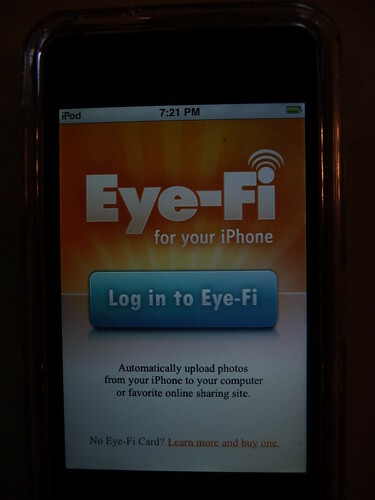 NOTE: There is also a new Eye-Fi iPhone app that I've just started to test - I'll post another article specifically about that soon. I'd like to thank the Eye-Fi team and especially Dave Zatz of ZatzNotFunny! for the opportunity to review the Eye-Fi Explore Card.